Yesterday I mastered a new (the second one) recipe of the French cousine: " Soup a l'onion gratinee" , i.e., onion soup in little bowls. I thought, excitingly poking with my spoon into am exquisite browned cheese crust (Italians wisely included in the menu several popular local staples): why didn't I try to make it at home? Should be easy enough. So, last night I decided to go for it. 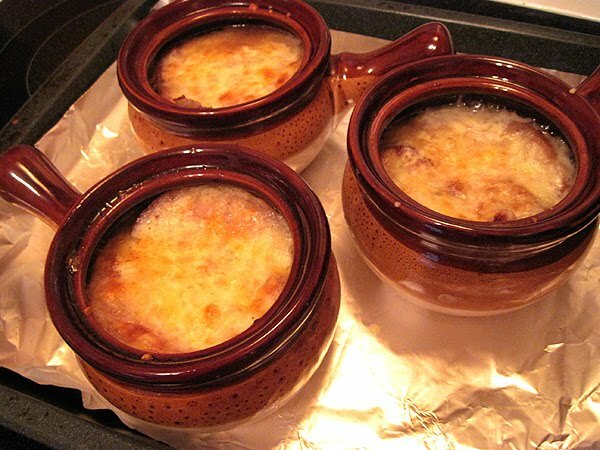 Like all antique recipes, onion soup is very simple, and at the same time annoyingly demanding. First, you need to make a rich beef stock - and it will take at least three hours. Classical recipe requires a "bouquet garnie" made of thyme, mayoran and bay leaf, soak in the stock for approximately an hour. I did not have mayoran and replaced it with rosemary. Then you have to caramelise a heap of the mincely sliced onions (approximately one large onion per person). Onion should caramelise evenly and become light-brown. It takes at least half an hour of non-stop mixing. When the onion is brown and started to stick to the frying pan, deglase it with sherry (I splashed some red wine). Then put the onion into the stock and let it cook together for 15 minutes. You will need croutones made of white bread. I put a few slices of baguette in toater and - voila! The classic recipe calls for Gruyere sheese, but I didn't have any and used some old Cheddar. The last step is simple: pour the soup into the oven-prove bowls, put croutones on top and cover with cheese (sliced or grated). Back for about 15 min to allow the cheese melt and form that typical browned crust - "gratin".